We previously wrote about why renting a modem from your Internet Service Provider is a bad idea both financially and performance wise. Delving deeper into the topic, here are 5 things you should look out for when shopping around for your modem. As an additional step, we also recommend that you call your Internet provider after narrowing down your choices, just to make sure. On the whole, buying your modem instead of renting will save you between $240 to $480 over the next 2 - 4 years. But you can save even more by buying a refurbished modem instead. So what are refurbished electronics? Most refurbished products are virtually new equipment which were either defective or damaged by the vibration of shipment. They are then returned to the manufacturer to be fixed. The repaired units are then re-tested to verify that the repairs corrected the problem. These products are sold again as "refurbished." If it's an older product which is refurbished, refurbishers replace the parts with a high failure rate, that are likely to cause problems. The upside of refurbished products is that they have been tested even more than original products from the factory as part of the refurbishment process. On the downside, they may have minor scratches due to the extra handling. 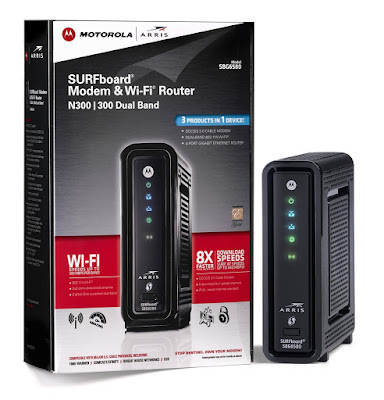 Let's take the popular ARRIS SURFboard SB6141 DOCSIS 3.0 Cable Modem as an example. If you were to buy it brand new, it would cost you $89.99. But buying it refurbished would cost you only $69.99 instead. If you have multiple devices connecting to the Internet over a wireless connection, in addition to a modem, you'll need a router which you can buy separately. While this has some performance advantages, we recommend getting a modem with a built-in wireless router so that you can avoid the worries of the devices being incompatible. One downside is that these 2-in-1 modems & routers tend to be a bit more pricey, retailing at around $120. When searching for a modem, you're bound to come across DOCSIS. So what is DOCSIS? Short for Data Over Cable Service Interface Specification, it is an international telecommunications standard that cable TV providers use to provide Internet access over their existing infrastructure. There's DOCSIS 1.x, DOCSIS 2.0, DOCSIS 3.0 and beyond. In a nutshell, the higher the DOCSIS number, the better the performance. A DOCSIS 3.0 compatible modem supports 42 Mbit/s per downstream channel and 30 Mbit/s per upload channel. This means that a mid-range DOCSIS 3.0 modem with 8 downstream channels and 4 upstream channels will be able to support a download speed of around 343 Mbits/s. Do note that no matter how "fast" your modem is, you will be limited by the speed of your Internet connection. If you have a 343 Mbit/s modem on a 100 Mbit/s Internet subscription, your download speed would still max out at 100 Mbit/s rather than 343 Mbit/s. Having said that, it doesn't hurt to have the extra horsepower, which can come in handy if you're offered free or promotional upgrades from time to time. While this is very important and you should confirm that the router you intend to buy will work with your existing laptop, desktop and wireless devices, with industry standards this is becoming less of an issue these days. Do take a cursory look though. So there you have it, our 5 most important things to consider when buying your own modem. We'd love to hear from you if there are any other factors we should consider.